180 Medical is a national leader in the intermittent catheter supply industry, and we also provide ostomy and other related supplies. We recruit employees who are positive, hard-working individuals who want to enjoy going to work. We offer a competitive benefits package, extensive training, and many fun extras and perks. 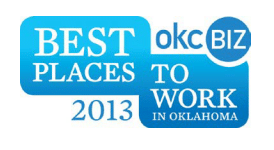 180 Medical has been named one of the Best Places to Work in Oklahoma once again in 2013. This month, we’re excited to feature Christina from our Documentation Specialist department! She has been on staff here for a little over 8 months now, and she is very happy to be a part of the 180 Medical family. What are some of your duties as a Documentation Specialist? I enter new patient information, check and upload documentation, verify insurance information, and occasionally call patients for insurance information if it was not included on the original referral from their doctor’s office. I also handle getting authorizations that various insurance companies may require. Some of what we Documentation Specialists do are “behind the scenes,” but we work hard to bring our customers the fastest and best service while maintaining a top quality experience. What do you love most of all about 180 Medical? I just love the work culture and the friendly environment here. Everyone comes to work with a smile on their face, ready to tackle whatever the day throws our way. No one is a stranger here. Everyone is super friendly and genuine. I am a very hands-on kind of person, so I enjoy building, fixing, creating, writing, crafting, etc. I also like to dance. I am passionate about OU, and I actually used to work for OU football while I was a student. It was a neat time in my life, because I got to go to every game, both home and away, and I met a lot of people, including players who are now in the NFL. What’s something special about working for 180 Medical? We’re all a big family here. In my department, we’re such a great team. All of my fellow Documentation Specialists have been so helpful and welcoming. It is fun to watch my co-workers interact, from giving advice or sharing good-natured jokes to just enjoying each other’s company. You never get the feeling that people are just pretending – there is a genuine bond our team shares, which is awesome considering how much the company continues to grow. And that’s a part of what’s great about 180 Medical: it’s a wonderful place to grow in your career. I know my supervisors are there for me and truly want to see me succeed and grow. There’s a reason we’ve been picked multiple times as one of the Best Places to Work in Oklahoma! What’s one of your favorite stories of how you helped a patient? I often call patients to obtain insurance information if we don’t have it when their doctors initially refer them to us for their supplies. One day, I was calling someone but their phone ignored my call, and I left a message. Later on in the day, I called again, and this time the man answered and said he had ignored my call earlier because he had just found out he had prostate cancer and didn’t want to take that out on me. We talked for a little while, and after a deep breath, he said he was determined to beat it. He was just so uplifting and encouraging. I told him we would be with him through the process, and we are here for him. He has started a journey with us, and he doesn’t have to face it alone. He thanked me for my help, and it felt wonderful to know we had both touched each others’ lives in a way. What’s a quote that inspires you daily? Phillipians 1:3 — “I thank God every time I remember you.” It puts a smile on my face and reminds me that everyone needs prayer and kindness because you never know what they’re going through. For many of our patients, the journey of starting to use catheters or ostomy supplies may be a new one, and that can sometimes be a difficult transition. But because they chose 180 Medical to supply them, that’s a life that we get to touch. We are blessed to be able to take care of their supply needs and make that part of their lives a little easier. Thanks so much to Christina and all of the Documentation Specialists at 180 Medical! We offer a variety of positions in different departments, and there is plenty of opportunity for growth and development within the company. Keep watching for more Employee Spotlights in the future, and look into a career at 180 Medical today! Learn more about Amanda, her job position as an Ostomy Specialist, and the positive work environment at 180 Medical. Meet one of 180 Medical’s employees and find out more about what makes working at 180 Medical so great. We’re hiring now, so take a look at what the Confirmations Specialist position entails as well.